According to a friend, the Boy has dropped. She tells me this probably means he won't be late, since my body is positioning everything in preparation for birth. I can't tell the difference. A huge belly is a huge belly, whether it's high or low. I had my "Ahoy, It's a Boy" shower last Saturday, and a girl's night type shower on Wednesday. 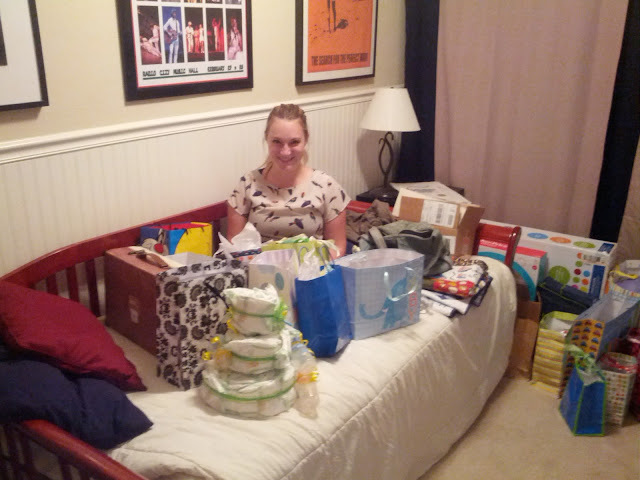 Above, I'm sitting among the gifts from both showers. This weekend is my brother's mission farewell; he's leaving for Bolivia on Wednesday for two years! Since we were coming to town for it, the girls and women from the ward [church] I grew up in were awesome enough to throw me another shower so everyone I know can celebrate with us! So that's what I'll be up to this weekend. This week, sleeping officially crossed over to the "I wish I could take some tranquilizer" zone. I wake up every 2-3 hours for at least one of several reasons: I'm so blazingly hot that I think my skin will melt off, I have to pee, or my back hurts from being unable to find a comfortable position. The worst of all three is the heat. I've noticed some slight swelling in my hands and feet. My wedding ring started to get a teeny bit snug, so I took it off so it doesn't end up getting stuck. So now, I'm either ringless or rocking a man-size ring. The swelling in my feet isn't uncomfortable at all, just ugly. My calves are thicker, my feet and toes are chubby, and my sandals leave squeeze marks on them like when you wear a brand-new rubber band on your wrist too long. I had a doctor's appointment this week, and I'll be having one every two weeks from here on out. I finally remembered to record the baby's heartbeat, just so I can listen to it whenever I want. I spent tons of time working on my Baby Book Smash Book and have been having a lot of fun with it! We took our hospital tour this week, and I'm not super comfortable with the hospital we had previously chosen. I'm going to sign us up for another tour and we'll make our decision by comparing the two. We're just putting on the chubs, over here, since they're so important. 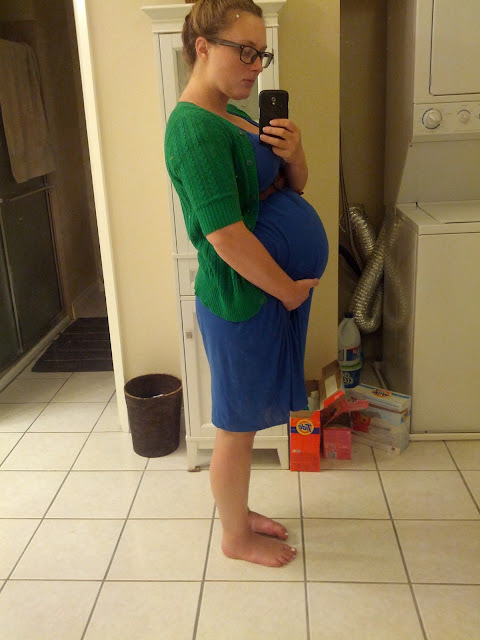 Boy is almost full-term and full-size, so we're really almost there! Send me your advice! Any products out there that I simply MUST try? Any parenting advice I shouldn't go on without?